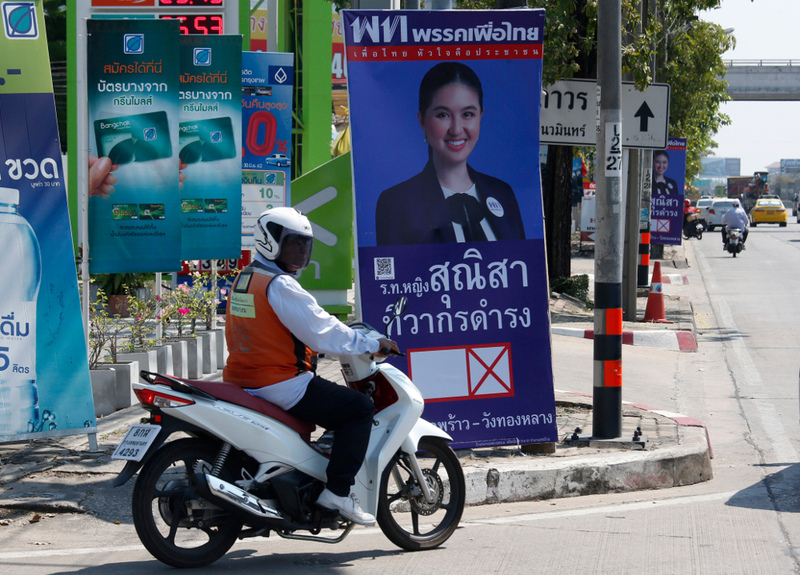 A motorcycle taxi passes by an election poster of Pheu Thai Party candidate Sunisa Tiwakorndamrong in Bangkok, Jan. 24, 2019. Facebook says it will block foreign-sourced electoral ads in Thailand in the run-up to national polls on March 24, but the move is “unrelated” to a request from the Thai junta, according to a spokesperson for the social media giant. The California-based tech company, which claims to have 52 million users in Thailand, undertook the move a week after promising to take tougher steps against “fake news” ahead of key elections in the Asia-Pacific region. “As part of our commitment to safeguard the integrity of elections, we will be temporarily expanding enforcement to not allow foreign electoral ads in Thailand in the lead up to the elections,” Facebook said in a statement posted on its Newsroom page and dated Wednesday. The restriction is expected to take effect in mid-February and will apply to electoral ads if they are being run by advertisers based outside Thailand, the statement said. It explained that both “automated and human review” would be used to identify ads that would be blocked. Facebook’s move came under fire from political observers, because it came less than a week after Thailand’s election commission released strict guidelines on political campaigning, which targeted social media. “Learning from every election over the last two years, we have increased our capabilities to take down fake accounts, reduce false news, disrupt bad actors, support an informed and engaged electorate, and increase ads transparency,” said Katie Harbath, Facebook’s global politics director whose name appeared atop the statement. Thailand is set to exercise its first election since the military seized power in a bloodless coup nearly five years ago, in May 2014. Apart from Thailand, national elections will take place this year in Indonesia and India, as well as legislative elections in the Philippines. In its guidelines released last week, the Thai election commission said it would ban social-media posts that contained anything other than candidates’ names, pictures and biographies, and the party name, logo, policies and slogans. Political observers said the commission’s rules were apparently aimed at progressive Thai parties that rely heavily on social media. The March vote, they said, would be heavily influenced by young voters who are social-media savvy, since more than 25 percent of the nation’s voters are about 18 to 35 years old. “Thailand’s military regime has a minuscule social media presence compared to the democratic opposition and clearly recognizes the upcoming election will be largely won or lost online,” Shawn Crispin, the Bangkok-based representative of the Committee to Protect Journalists, told the South China Morning Post (SCMP). Crispin said the young, first-time voters in Thailand would be expected to take their cues from social-media influencers. “Facebook’s ban on electoral ads will thus likely help the junta’s proxy party and hurt the more social media-savvy opposition,” Crispin said. A Facebook spokesperson, who asked not to be identified, told BenarNews that the company's action was "consistent with our approach to elections around the world." "It is unrelated to a government request," the spokesperson said in an email, underscoring that the online platform did not take the action in response to a request from the Thai junta. It is not the first time that Facebook has rolled out election policies. The social networking platform recently announced tougher rules on political advertising in India, which is expected to go to the polls in April and May. The junta’s latest social-media campaigning restrictions were seen by observers as an apparent extension of an array of recent computer-crimes law aimed at gagging dissent in the country. Thailand already has Lese-Majeste, a strict anti-royal defamation law that forbids insults to members of the Thai monarchy. “When speaking of the youth, this definitely affects their political engagement and awareness,” Future Forward party spokeswoman Pannika Wanich told The Guardian newspaper, referring to the restrictions. “Without a doubt social media has been the main platform for communication and access of information during this period,” she said. Facebook said it would roll out a “Tips to Spot False News” advertorial in Thailand, in partnership with local organizations, such as the Sure And Share Center of the Thai News Agency and Chulalongkorn University. “We are also committed to supporting Thailand’s news industry, especially during the elections period,” it said. Despite concerns over its handling of its users’ privacy, Facebook’s latest earnings report showed that it had increased its user base in Europe and North America. From October to December last year, Facebook said, the company added 4 million daily users in Europe, for a total of 282 million, as it also registered 1 million in the United States and Canada, bringing its user base in those two countries to 182 million. Updated to add Facebook comments emailed to BenarNews.